Finally! After five (or six?) submissions, I got Will's blessing. After just one, relatively straightforward, set of edits, it was ready to go. The seed of this puzzle came from "turkey trot", as I was considering participating in the annual Detroit Thanksgiving 5k race by that name. I didn't end up running, but I did get a good puzzle idea out of it! Soon I was wracking my brain for similar "animal walk" phrases. "Bear crawl" and "frog march" all came pretty quickly, plus they were a crossword-friendly 9 letters to boot! I knew I needed at least one more, or a revealer of some sort to put the puzzle into submission realm. I resorted to my old friend Google to search for animal phrases. "Goose step", also at 9 letters worked well, but frankly "Chicken Run" was my least favorite as it did not seem as "tight" as the others since it was not something "doable" by a human – like the others. For my debut I was excited that Will used most of my fill, though probably less than half my clues. His cluing was certainly "fresher" than mine. I mean, "Raiders of the Lost __" ? That was just plain lazy. I love his replacement! After 35+ years of solving NYT puzzles, I am positively thrilled to finally join the club of constructors. One down, hopefully many more to go! Debut! Nice and consistent theme, phrases in the form of (animal + movement). 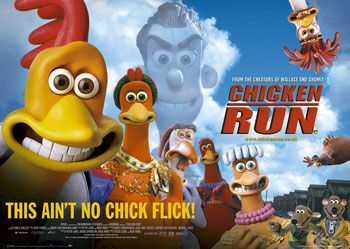 I loved CHICKEN RUN, by the maker of "Wallace and Gromit," and BEAR CRAWL and TURKEY TROT are such fun terms. FROG MARCH … a bit off-putting, but colorful nonetheless. GOOSE STEP. Not sure a term so closely associated with the Nazis is something I want in my daily diversion. I might have chosen to leave it out, personally. Another reason to leave it out – look how nicely BEAR CRAWL could slip into GOOSE STEP's spot – is that working with a middle 9-letter themer makes the construction SO much harder. With just four themers, you have so much flexibility. Pretty easy to produce a colorful and smooth grid. Five themers, including a middle 9, is almost always going to require a couple of trade-offs. It creates all sorts of problems in the four corners. Start with ABBES to kick off the puzzle. Probably worth the nice ALFALFA, BARRIOS, BROKERS. It's super important to have a solid 1-Across since there's only one first impression you can make on your solver, but I think that NW corner is pretty good. In the SE, was ALLSTAR worth the price of WBA, LOGE, ELLO, SRA? To me, probably not. But I'd listen to arguments otherwise. Toss in some OSMIC, DES, ERGS, ETES … I'd have liked a smoother result, given that it's an early-week theme. Eliminating a themer would have allowed for that, but more cheater squares could likely have helped too. I like Bruce's usage of black squares before BALD and after ERGS – that most certainly made the NE and SW corners smoother. Another pair of added black squares in the opposite corners could have been useful, too. A good debut, especially in terms of themer consistency. A couple of hiccups in execution. Answer summary: 1 unique to this puzzle, 4 unique to Shortz Era but used previously.